All this year, as a Church we have chosen to focus the energy of our worship services on the issue of creativity. We are spirit, and as spirit, we are a part of the Creative Force of the Universe, that pure, unadulterated conscious Creativity that is sometimes labeled “God.” We are here on this planet of substance and mass, to learn to be children of God, to learn how to create through physical matter. Each of us is spirit, and as spirit we have individually chosen to experience life on Planet Earth through the vehicle of a body. Just as our Creator brought to life Mother Earth, each of us in conjunction with two other souls who agreed to play the part of our parents, have created a physical presence for use in our adventures on Planet Earth. When a baby is born, there is often a profound sense of excitement in the delivery room as all the participants in the birth process witness the tremendous power and beauty involved in the level of creativity it requires to bring spirit into matter. We think of this type of creativity as “good,” and we usually honor the birthing process, whether it’s the birth of a human being or another baby animal of some type. It is perhaps unfortunate that we don’t have the same reaction of joy at the end of the cycle when that same baby human or baby animal is ready to rejoin its creator through the dying process. We classify destruction as “bad,” and dying as an experience to be avoided at all costs. We forget that from a spiritual perspective, there is no “good” or “bad,” there is just experience. We take pride at what we create when it’s a baby or a great piece of art. We like to acknowledge that we were the creator, or a part of the creation. But we tend to deny our ownership when that spiritual creation expresses the flip side of its manifestation. The destruction of an object, an idea, a relationship, or a physical body or bodies, is usually met with great resistance. Although it also can take tremendous amount of spiritual energy to successfully change form from physical matter back to pure energy, and this transformation can be both beautiful and profoundly humbling, we reject destruction, even when it is obviously the time for it. Even the most enlightened of us, tends to play victim at times of destruction. 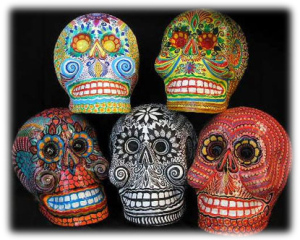 Humans tend to see death as something that happens to us, as something that is forced upon us against our will. Some of us can acknowledge that we create our own reality to a point. But if that point includes destruction, whether its destruction in the form of our body or the body of a loved one going through its end process, or whether it is destruction on a mass scale as we see everywhere in society these days, then suddenly we’re back thinking that someone else created it. We start blaming the destruction on “fate,” on our parents who gave us a certain set of genes, the president, the government, or even God–just not us. Why is that, you might ask? Why do we reject death and destruction so thoroughly that we do not even like talking about it? Why do we create things being destroyed in the world around us, and then resist our creation. Why do we refuse to really look at the fact that life on Planet Earth does not exist without death, and death cannot exist except where there is life, and that the two are intimately connected. Why is it that we try to sweep the whole subject under the carpet, and do not allow ourselves to notice how this rejection of the dying process diminishes the richness of our living process. Even now some of you may be wondering why we have a whole church service devoted to such a “gloomy” topic. The bottom line is that our bodies do not like to be reminded that they are mortal. Even though, essentially, they begin the dying process a second after they come into existence through the birthing process, they do not like this fact. They can become quite grumpy about the thought that they will cease to exist when we are ready to move on. And so our bodies like to try to distant us from the reality that destruction of all physical matter is inevitable. They go into fear and when we are in fear, we allow ourselves to reject the truth. The truth is that destruction of all that is physical is inevitable. It’s just a question of time. Even the Planet Earth is scheduled for destruction. Scientists tell us their best guess is that the Planet will die of natural causes somewhere between one and four billion years from now, unless a comet or something destroys it prior to that. But fear not, ladies and gentlemen, because you will not die. None of you will. Not really. Because everyone in this room is spirit and none of you will cease to exist when your body is at its final days. Some religious teachings to the contrary, you do not have to “earn” eternal life by being baptized, or living a good life, performing some act of charity, or anything. You are spirit and your Creator gave you life and it will not be taken from you. Your body will come to an end some time, but you, the real you, will not die. This poem has always seemed to me to give very questionable advice. I am not suggesting that one should approach the death of the body passively. Raging can be a useful experience at times. But to the extent that we understand that we are spirit and will not die when our body takes its last breath, we can accept that death of the body is largely irrelevant. We can welcome, rather than spend time and energy fighting against the inevitable. Destruction itself is just another form of spiritual creativity, a thing of beauty. In counties outside of the United States, there is often a greater awareness of destruction as a form of creativity. While I was preparing for this sermon, I had fun learning more about Shiva, and I’d like to share some of what I learned about this interesting symbol of Indian spirituality. Hinduism, like Christianity, believes that God has three manifestations in the universe. Most Christians believe that there is God the Father who created heaven and earth; God the Son, also known as Jesus Christ, who came to be with humans in our every day living on earth; and God, the Holy Spirit who is often portrayed as tongue of fire. In Hinduism, God is seen as Brahma who is the Creator, Vishnu, who is the Protector, and Shiva, who is the Destroyer. Shiva, the Destroyer is that funny-looking God with many arms covered in ashes usually portrayed in a meditation pose or dancing gracefully within a halo of flames. In one hand he often is holding a sacred drum to beat to summon up new creation, and in other a tongue of fire. He dances the destruction of Maya, or the destruction of the illusion, the lie that the physical world as seen through our senses is real. 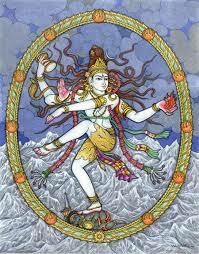 Shiva dances as he annihilates the world at the end of each age, making it possible for Brahmin to recreate the world. Through Shiva we see very clearly that creation and destruction are two sides of the same coin. Shiva the Destroyer is also known as Shiva the Liberator. He destroys that which is less in order to make room for that which is more. In the Christian tradition, people are baptized with water in order to be reborn to a new life based on spirit. Shiva baptizes with fire for the same reason. From both religious traditions we learn that we must destroy our reliance on the physical in order to come fully to eternal life as spirit. 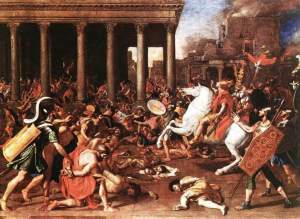 Destruction of the Temple at Jerusalem. Painted by Nicolas Poussin, 1640. What I hear in these words, is a question all of us would benefit from asking ourselves on a regular basis. What aspect of our self or the world that we have created around us, must we destroy and allow to be destroyed, in order to know God? This is a particularly relevant question at this time. As we come together as a Church at the end of the year, during the season in which nature is destroying many forms of plant materials in order to make room for the new growing season to come, we are faced with a world in which destruction is imminent everywhere on the globe. My belief is that we are living at a time in which things are changing to a greater degree than at any time in the history of Planet Earth, with the possible exception of the changes that occurred at the time of the Christ. What this means is that many individuals and many groups of individuals, whole families and cultures and societies, entire industries and religious, political and economic groups, and other forms of human organization, will be destroyed in the next few years. In my mind, this is a given. It’s the time for it to happen and it has to happen. Because many of our creations have been built on a foundation of scarcity, they must come apart so that there is room for that which is more. Conditional love must give way to unconditional love. The earth and all the life upon it is experiencing a baptism of sorts at the present time, a baptism of fire and water and all sorts of elements as the very energy of the planet transforms itself. We can resist the destruction of the old ways, or we can welcome the process and celebrate it as the God-given healing that it is. What we cannot do, is stop it. As I walk around the world these days, I find myself grievously saddened by the plight of people not understanding how their resistance works against them. Just like it can be painful to watch someone try to drive by stepping on the accelerator of their car with their foot still on the brakes, I am constantly saddened by watching individuals trying to work through a body that has been conditioned to resist the God within. Resistance, of course, creates pain and hardship. When we do not resist the healing power of destruction, that other end of the cycle of life, then we are able to shape the destruction into forms that are less painful or even devoid of pain. Shiva is both the Destroyer and the Liberator. He is the deity in which all opposites meet in a fundamental unity. On the way to that unity he can manifest either a safe refuse or a violent side, depending on what his followers need to experience. I’d like to wrap up my sermon today by recounting a recent episode of the television show “Joan of Arcadia.” For those of you who are not familiar with it, this show is about a white, middleclass teenager living in the suburbs who, for no explicable reason Joan or the viewer can discern, begins to receive visits from God. God shows up in the body of a telephone repairman or person on her bus or some such, strikes up a conversation with Joan and usually ends up giving her some task to do that this very normal teenager sees as stupid or embarrassing. After working through fear that she is crazy, and anger and “why me?” Joan learns to expect these random visitations. No explanation if ever given why the task is to be performed, to Joan’s utter annoyance, resulting in Joan sometimes reluctantly doing as she is bidden and sometimes telling God to take a hike. We watch God validate that she has free will, as we learn the price of this responsibility, and we watch as Joan’s faith begins to grow and she begins to understand how the universe works. In a recent episode, God tells Joan that she needs to make sure that her best friend Adam does not have his sculpture in the school art fair. Adam is a kid with very low self esteem but is a talented artist who it seems would benefit greatly from winning this competition. God tells Joan that under absolutely no circumstances should he be allowed to have his sculpture in the competition. As usual, he doesn’t offer any advice as to how Joan is supposed to prevent this. Angry and confused and very scared for her friend, Joan tries to convince Adam to withdraw his entry. When he refuses, she takes a hammer and smashes it into bits. We need to get over our resistance to the idea that the world around us is rapidly disintegrating in ways that we do not even understand. We need to put spirit in charge of the process and allow ourselves to flow with the river, a river that is increasingly engorged with flood waters, rather than try to swim against it. As each of us individually cultivates a spiritual perspective, we will be able to imagine ways in which the world can destroy whatever needs to be destroyed, without the use of violence or other painful forms of change and we will be able to steer our collective creations in that direction. We can then experience any necessary transitions in relative comfort, and assist others in minimizing the use of dehabilitating energies difficult for our physical forms. 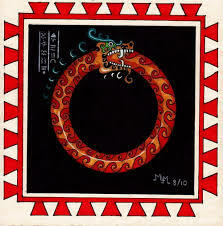 A Mayan symbol that captures the idea that creation and destruction are interrelated. Here at the Church of the Harvest, we have all that we need to weather the upcoming times and to shelter many other people around us who are more disadvantaged physically and/or spiritually. We know how to ground, thereby putting spirit in charge and creating a great deal of safety for both body and soul. We know how to work with the energies of heaven and earth and how to balance these in different ways and different times depending on what is required. We have many techniques and opportunities to release fear and resistance. We know how to look within our individual souls, and work as a community. We are in a great position to invite God to manifest its creativity in all its forms, validate destruction as part of the evolving path to everlasting life, and know peace of mind. We are blessed to have this space and each other. It is my sincere desire that in the upcoming year we will find increasingly ways to be of service in the task of destroying the old, welcoming the new, and enjoying the journey.